This information was originally on Atari's Jagwire site. 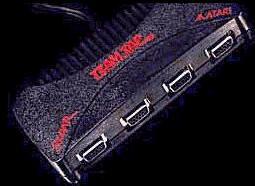 The Team Tap is a multi-player adapter for the Atari Jaguar 64-Bit Interactive Entertainment System. The Jaguar Team Tap allows up to 4 players to play compatible 4-player Jaguar games and 8 players to play compatible 8-player Jaguar games. Use Team Tap to play up to 4 players with White Men Can't Jump and look for new multi-player/Team Tap compatible games soon.